Blessed life: Margie and Peter Miller missed each other when they were supposed to meet for the first time but then met each other anyway, on the bus back to hometown Warwick, where they have lived happily married. THERE was an old lady who swallowed a fly, and then there’s Margie Miller. Unlike the dame in the popular nursery rhyme, it wasn’t a fly or a spider or even a bird that slipped down Margie’s throat. “I used to sing in the parish choir before I swallowed a bone,” Margie explains. The bone got lodged in Margie’s larynx, so at 8pm she paid a visit to the local doctor who sent her immediately to the Toowoomba hospital. Unfortunately, the ordeal meant she lost her place in the choir at St Mary’s Catholic Parish, Warwick, a group she joined with her mum and aunties when she was a child. “Now it’s alright a lot of the time, but then, it squawks,” she said, laughing. 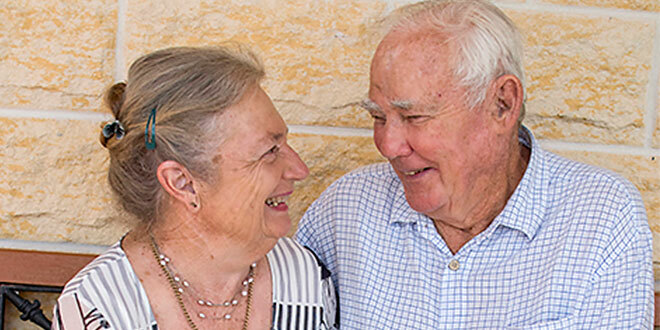 Margie’s sense of humour and energetic approach to life has seen her through 75 years of highs and lows, and all of them, including losing her singing voice, transpired in Warwick. Among the more “embarrassing” highs was winning two prestigious medals – last year’s fuss with the personal vice-regal medallion from Governor-General Sir Peter Cosgrove, and just last month, more drama with the Medal of the Order of Australia for her service to Warwick. “I can’t get into my head what I must’ve done to get the honour,” Margie said about her Australia Day award. She insists she got her medals “for having fun” but those close to her can recall decades of love, sweat and tears for the people of Warwick, where she was born and where she’ll die. As a child, Margie was often caught putting bandages on the house stumps, a cute hobby that shot her into a career as a nurse. After training as a nurse in Warwick for four years, she transferred to Brisbane’s Mater Hospital to study midwifery, and then moved to Allora where she attended to “whatever Allora brought in”. She was matron at Allora when she met Peter, “the boy from around the corner I never met”. A colleague who turned out to be Peter’s cousin tried to arrange for the pair to meet, but as he was a sea merchant, it was nearly a year before the fateful day. And even that was a disaster. “He was waiting for me downstairs at Piccadilly Arcade and I was at Centaur House which was a nursing centre house in Brisbane,” Margie said. “Somebody (Peter) rang up and said they’d like to meet me. “I got in the lift and it was one of those cage lifters, it got stuck between two floors and I’m yelling out, ‘Hello, I’m stuck, let me out of here’. But like a lot of things in Margie’s life, there was a happy ending. “He was coming home to Warwick on the bus the next day, and I was coming home on the bus,” Margie said. The couple exchanged letters for some time before tying the knot in Warwick in February 1966. Back in Warwick, Margie continued working as a midwife treasuring the “magical” moments of seeing a newborn baby. Margie welcomed four babies of her own, three of whom were born in 30 months. Sandy, Robin, Gordon and Richard are her pride and joy, but only half the children she dreamed of raising. “Seven sons and a daughter was what I wanted,” she said. This was one of her lows, but the greatest loss in her life was also Margie’s biggest life lesson. On her birthday in 1979, her son Robin was diagnosed with a rare and aggressive form of leukaemia. “I used to think if anything like that happened to me I wouldn’t be able to handle it,” she said. Margie would travel with Robin to Brisbane for treatment, but when they were back in Warwick tried to keep life “as normal as possible”. Robin was a keen runner and even with cancer he took to the track on school sports days. He was also keen on visiting the pony club regularly, riding off into the distance on a Friday after school. He told his mother that the pony club would probably close when he got to heaven. He got there on December 6, 1979, nine months after his diagnosis. “You teach your children how to live, but he taught me how to die,” Margie said. “He accepted it, it was going to happen – you don’t sit and mope and brood about what would have been, could have been, or wasn’t. “I used to always pray when they were little that they’d all grow up to be men because you’d like to think your kids are going to grow up. “When he died I realised age doesn’t make the man. “He probably died a bigger man than a lot of men that live to be 100. Robin’s death gave Margie a new perspective on nursing, and she made sure to give all her patients a chance to live life to the full. This included a private nursing job for a married quadriplegic man “who wanted everything done perfectly yesterday”. “I take my hat off to him because it must have been terribly hard to suddenly find you couldn’t do it,” Margie said. Margie also found a way to honour her son’s memory while supporting and even counselling other families shaken by a leukaemia diagnosis, another reason she was honoured on Australia Day. Robin’s dying wish was to raise money for the newly formed Leukaemia Foundation, which had supported him during his entire cancer treatment. To honour his wish, Margie founded the Warwick branch of the Leukaemia Foundation, which still exists today to support grieving families. The branch offers five-star accommodation to “keep families togethers” and raises funds to help families with their trauma. Margie is a life member of the branch, which she hopes will stop children like Robin from dying of leukaemia. Although Robin won’t be around to see his mother receive her Australia Day medal in April, she keeps his memory alive with humour. If any door creaks, or if a pair of keys goes missing, guess who comes to mind? “If things go wrong it must be him,” Margie jokes. Humour also keeps Margie alive, and she’s enjoying her retirement on a 56ha property where she gazes at her cows, horses, dogs and “a million little blue wrens”. “I couldn’t live in a city – I’d go mad,” Margie said. “I don’t want to live in an area where if you throw your tea leaves out the window they go in the next-door neighbour’s lounge. “I’ll stay here until I die – they’ll cart me out in a box.